Medical sources in the Gaza Strip have reported that one Palestinian was killed, on Monday at dawn, when a tunnel, used for smuggling goods into the besieged coastal region, collapsed on him.The tunnel is on the border with Egypt, in Rafah, in the southern part of the Gaza Strip. The slain Palestinian worker is 24 years of age from Khirbit al-‘Adas village, north of Rafah. He was buried under the rubble while he was conducting maintenance work. It is worth mentioning that the Egyptian army is still conducting its campaign against all siege-busting tunnels on its side of the border. On Tuesday at night, February 2, two Hamas members were killed in a tunnel collapse incident in southern Gaza, just a week after seven fighters were killed, in a similar accident, in northern Gaza. 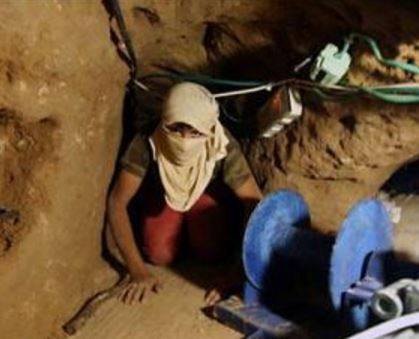 While the tunnels are used by Hamas as a source of tax revenue and inflow of weapons, they also supply highly-demanded necessities for Gaza’s 1.8 million residents under the blockade, including food, medicine, as well as infrastructure materials like concrete and fuel. Many Palestinians, not affiliated with any group, work in the tunnels to provide for their families, especially amidst the high levels of unemployment and poverty.